Grand Teton National Park is a national park in the United States. It is south of Yellowstone National Park. Both of these parks are located in Wyoming. The park's namesake mountain, Grand Teton, is popular for mountain climbing. The enigmatic Colter Stone, with the inscription "John Colter", was found in a field in eastern Idaho in 1931. "The Three Tetons" as seen from west of the Teton Range by members of the Hayden Geological Survey of 1872. One of the earliest photographs of the Teton Range taken by William Henry Jackson in 1872. 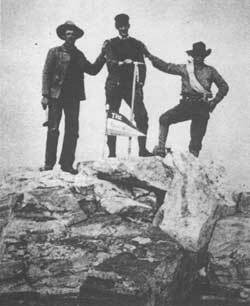 In this image taken by William O. Owen in 1898, his climbing partners John Shive, Franklin Spalding, and Frank Petersen are depicted on top of Grand Teton. The Teton Fault near the base of Rockchuck Peak creates a nearly horizontal line above the trees in the foreground. Middle Teton Glacier on the northeast slopes of Middle Teton has numerous crevasses. 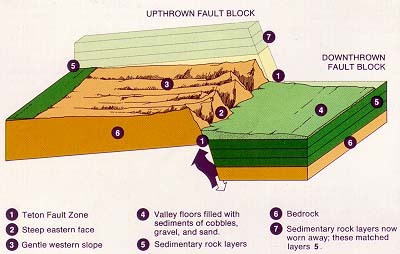 The geologic feature known as the Black Dike is a diabase intrusion into older gneiss and is visible on the east face of Middle Teton as a dark line bisecting the peak. Low larkspur is one of over a hundred flower species found in the park. The purple cones of the whitebark pine protect seeds that are an important food source to a number of species. Though cougars are present in Grand Teton, they are rarely seen. Snake River fine-spotted cutthroat trout has tiny black spots over most of its body. Hiker crosses snowfield en route to Paintbrush Divide. Grand Teton National Park Facts for Kids. Kiddle Encyclopedia.